I have an external Hard Drive with two bootable partitions on it. The first is an image of a Mac OS X 10.6 Install DVD, and the second is an image of a Mac OS X 10.6.3 Install DVD. When I plug the hard drive into a Mac Mini, and turn it on holding down the Alt key, I get the option to select which boot device to use. However both my bootable images are named "Mac OS X Install DVD". How would I change the name of the bootable image? I have already tried changing the partition names but this has no effect. Note: I originally asked this on SuperUser, but upon discovering this site, I asked it here also. This is an older post, but I came across it today and figured I'd share what I found. sudo bless --folder "/Volumes/Mac OS X Lion Install ESD" -label "Lion Install"
Whatever you put for the label is what should show up at the choose disk screen when holding option during a boot. Note that you'll probably want to do this in addition to renaming in Finder or Get Info just to keep them somewhat in sync and make them easier to identify in either case. Unless I'm totally misunderstanding your question, this is pretty simple. You can change the volume name just by right clicking it in finder, choosing "Get Info", and modifying the "name and extension" field. Or slow clicking twice on the name of the volume as it appears on the desktop, and editing it just like any other file name... I do this all the time with bootable volumes and it works just fine. Your installer doesn't have to be called "Mac OS X Install DVD". The installer doesn't care what you call it. Name one "Crap Bag" and the other one "Princess Consuela Banana Hammock"... no one will care and OS X will still install just fine. I just tried this with a USB stick I created that has the 10.6.3 installer on it. 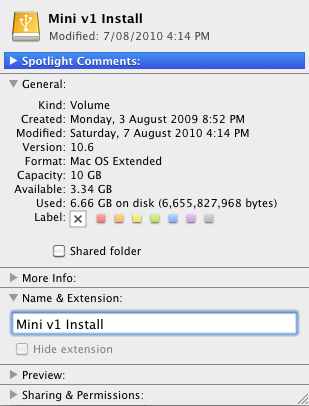 I had already changed the name from "Mac OS X Install DVD" to "10.6.3 Installer minus Optional". I just changed it to "10.6.3 Banana Hammock" and when I booted with alt, that is what was displayed. There must be something not explained here that is causing this... maybe partition schemes other than GPT don't work this way? What method did you use to put the images on the bootable partitions? I ask because I'm wondering if you just copied the images themselves rather than cloning or restoring them to the partitions. I've never tested this, but I'm wondering if it's possible to have .dmg files that are bootable on a partition. The behavior that would arise would be in line with what you're describing. You could change the partition/volume name, but it wouldn't affect the name of the dmg file. Even if you changed the dmg file name, that wouldn't affect the name of the disk image (volume) contained within the dmg file. If this is the case, I would think you could change the name by mounting the image in OS X, and then changing the volume name (the name of the volume that shows up on the desktop or in disk utility) that was mounted from the dmg or iso. Below are the steps I used to create my installer image. The main difference is Carbon Copy Cloner. It may not work any better, but at this point it may be worth a try since mine has the behavior you would like to see. Inserted OS X Install DVD. In Disk Utility, clicked "New Image". Chose "compressed" and "none" for encryption, clicked save. Once complete, I mounted the image and deleted the optional folder. Right clicked the mounted volume, chose "Get Info", wrote down the exact amount of space used in the image for files and folders, and unchecked "Ignore Ownership on this Volume". Went back to disk utility, inserted my flash drive, and made a partition named "10.6.3 Install minus Optional" that was about 500MB larger than the disk image's used space. Did another "get info" on the new flash drive volume and unchecked the ignore ownership option. In Carbon Copy Cloner: as source, chose the mounted installer volume, target was the new flash volume. Chose "Backup Everything" and "Delete items that don't exist on the source". Clicked clone. Afterwards, I am able to change the name of the flash volume, and whatever I change it to is what shows up in the boot menu. sudo bless --folder "/Volumes/Install macOS 10.12" -label "Install macOS 10.12"
sudo bless --folder "/Volumes/Install macOS 10.12/.IABootFiles" -label "Install macOS 10.12"
Plug in the external HD. Boot the mini from its internal HD. Go to System Prefs > Startup Disk. Each bootable system listed should display its OS version. Choose the specific installer you want. Not the answer you're looking for? Browse other questions tagged snow-leopard partition boot . How to change ISO volume label on OS X?